At the end of the road there's only one place left to check for the missing jewels of the land: the Temple of Godcat, home to the cruel felines that play the villains of the story. Can the team retrieve the jewels before Godcat is brought back and ruins the world? Time to find out! The entrance to the temple is in the northeast corner of Goldenbrick Resort. 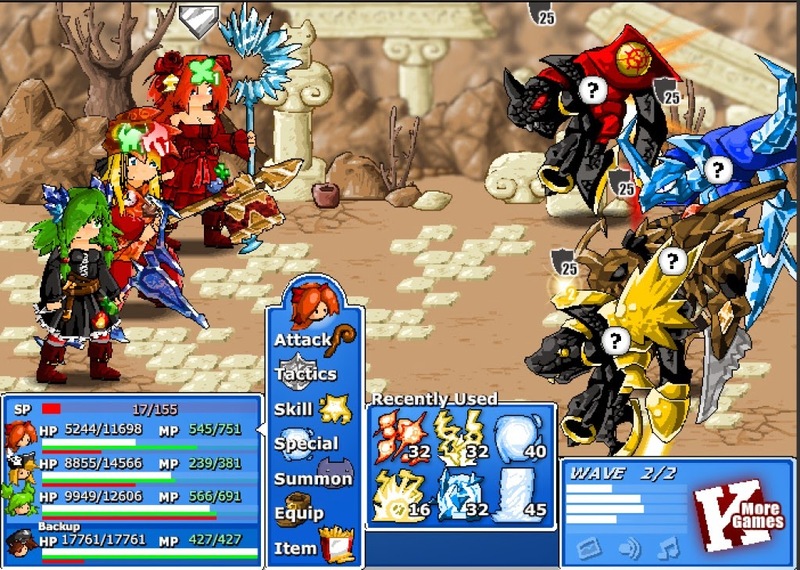 The enemies here vary from battle to battle, but as a general rule Wind works nicely when fighting off the baddies. Fire has its place as well. Make your way down the entry pathway, grab the eight Cacti, one Jungle Flower and Cake from the chest and make your way east. The next screen isn't much different; take out the enemies, grab the Red Scroll from the rocks in the north, the Blood Orb from the central pedestal and Mercury, two Bottled Darknesses and three Pink Potions from the chest in the south, and keep going. The next area has the Temple's Slime Cat. Use it first, take out the enemies, and hunt through the chests for two Plasma Balls, two Topazes, one Honeycomb, one Titanium, twelve Steel Plates and eight Shurikens. Check the cat statue on the right side for an Emerald and two Geodes. Yay, a shadowy cave! What fun. The first brazier is to your right, and you'll see another to the north after the first is lit. The enemies in here are largely icy in nature; change up to Fire for quicker kills. Check the chests for a Plutonium Core, six Springy Springs, Ham, six Ice Creams and two Sundaes. Light the three braziers to reveal a chest containing a Seraphim, six Red Feathers and eight Paper Talismans. Check the right side of the cavern wall for an Ice Cream before leaving through the top-left path. This will bring you outside, with a new set of enemies. Poison's good for getting through here. Check the chests for Beef, four Watermelons, two Sundaes, Mercury, an Opal, and behind a gold lock a Pope's Dress, four Satins and eleven Silks. (If you don't have a Gold Key, don't worry. You'll find one shortly.) 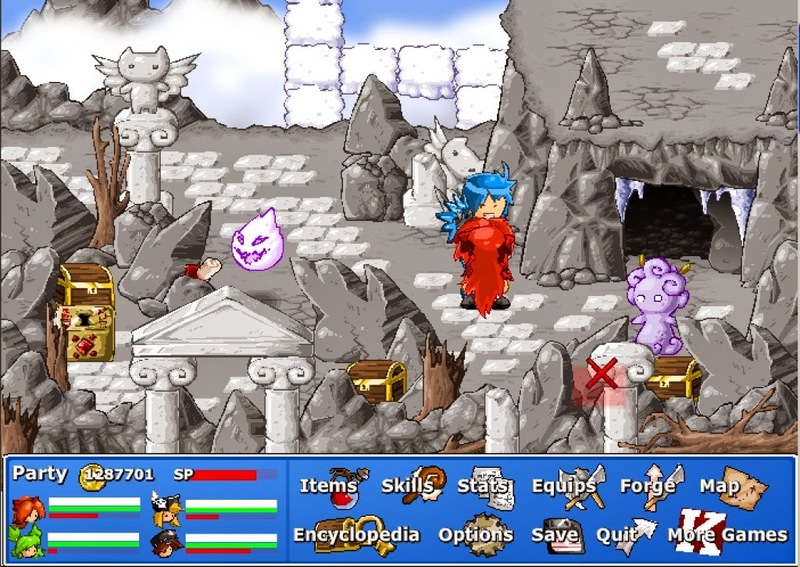 Grab the Red Scroll from the rocks on the left side of the screen and continue west from here. The Temple of Godcat. It's so glamorous. There are more holy enemies here and more chests, though you can't yet reach all of them. Take out the enemies and grab what you can: a Candycane, two Plasma Balls, two Dark Runes, four Amethysts, twelve Rainbow Gems and five Bubble Stones. Grab the Blood Orb, check the rock just above the pedestal for three Satins and eight Silks, and talk to the left woman here. If you have four Red Scrolls and four Paper Talismans she'll give you an Ancient Rune, Cake and a Donut. To the south! Down here you can hit a switch that will get rid of the spikes, opening the way back to the front gate and to a chest containing a Gold Key, two Dark Runes and two Topazes. There's another chest on the left side containing an Opal, three Geodes and two Emeralds, and you can grab a Red Scroll from just above the guy standing here. There's a Topaz and a Gold Plate hidden in the wall just above this. Carry on south and west. Open the chest on the bluff to get two Gold Plates, six Silver Plates and four Silks. Head north and you'll find a series of switches along with several enemies. Hit the first, second and fourth switches to get to the top of the adjoining path and the first and third switches to get to the treasure off to the side. The chests here contain Guardian, two Gold Plates, eight Paper Talismans, a Pope's Hat, a Candycane, a Golden Key, ten Rainbow Gems and a Ruby. Grab everything as well as the Blood Orb and set the two Orbs you have on the pedestals outside the door. Beat the dragon inside and go through the arch. Make your way to the top-right corner of the next area and hit the switch to get rid of the spikes to the south. This will open the way to another switch that will get rid of the spikes in the top-left. Hunt down the chests here for a Diamond, six Dragon Scales, four Watermelons, six Ambers, ten Magma Sources, one Honeycomb, three Chips and four Beers. Grab the Red Scroll from the rocks beside the arch and keep going. Back here you'll find the Temple's rear exit, leading back to Goldenbrick Resort. Push the rock at the end of this path onto the X to reveal a chest, then open all three to get six Dragon Scales, six Solid Spikes, six Curly Horns, two Gold Plates, four Emeralds, four Satins, one Donut, six Garlics and one Cake. Taking on the vicious baddies of the Temple of Godcat. Head to the north-west corner to wind up on the cliffs again. Up north is a Red Scroll and two chests containing two Pineapples, one Lollipop, one Candycane, one Opal, four Geodes and six Amethysts. Check the pot on the lower platform to get two Dark Runes and one Dark Matter, as well. Use a Stepladder to get across bridge to the east. More enemies? More indeed, and they block you at virtually every path here. 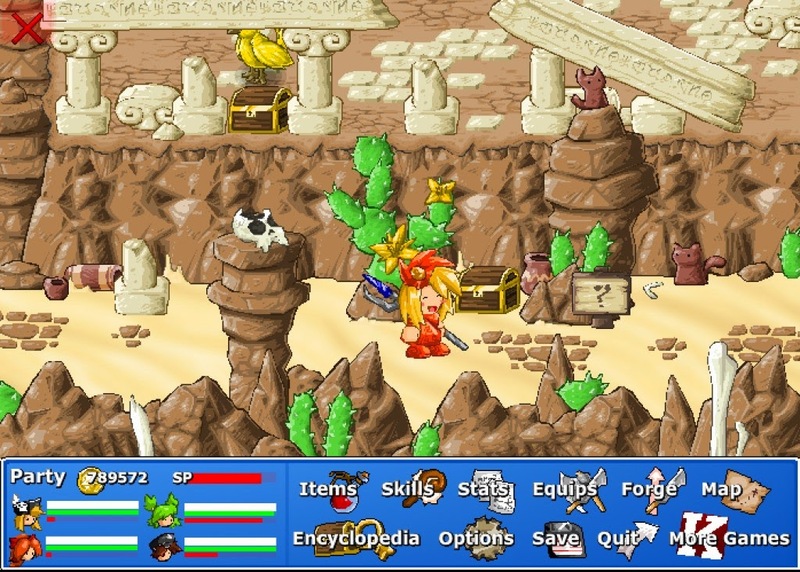 Fight your way through with the usual strategies, as none of the enemies are new. Start by looping south and back east to reach a bridge, across which you'll find Mercury, four Pink Potions and ten Glasses. Check the northern path for a Red Scroll and a chest containing a Honeycomb, four Watermelons and Sushi. After passing this point you'll reach the Slime Cat King, the final transport point in the Temple. You're almost to the final battle against the forces of Godcat! Prepare for the worst!